EDC’s business philosophy resides in taking care of our people, our equipment and the well, respectively. Our long term success depends on our ability to continuously improve our services while protecting our people and the environment in which we work. • Conduct all activities in a manner that ensures a high quality of services, meets contractual obligations, safeguards human life and health, and protects the environment. • Provide and maintain a safe working environment, conditions and equipment, coupled with training that will provide our employees with the knowledge and information necessary to safely carry out their assigned duties. EDC is implementing Quality Management System (QMS) and Environmental Management System (EMS) complying with the requirements of ISO 9001:2015 and ISO 14001:2015, which enhances business performance, better cost management, drives continual improvement and legal compliance in our facilities and operations. EDC Management is committed to implement this policy at all levels of the organization. EDC is committed to minimizing risk exposure to the employees' health during their assignment. People's health is multi-faceted and is challenged by both medical illness type and occupational risks with potential consequences in both the short and long term. Those health risks vary and are not just work related. At EDC we manage occupational health in the same manner as safety. 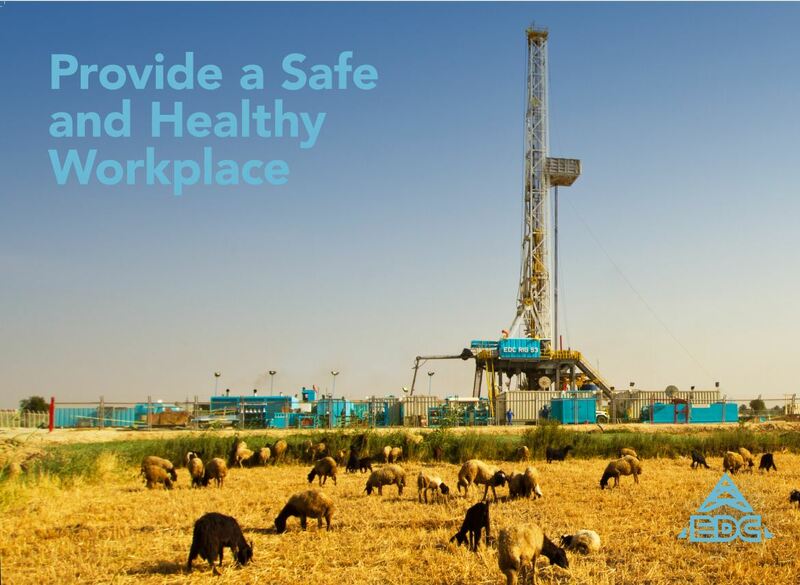 All occupational health and safety hazards are caused by energy sources, which can cause harm to our people. To manage those hazards, we identify energy sources that can result in unplanned or unwanted energy releases. We then manage the associated occupational health hazards by assessing the risks and taking preventive actions. Occupational health procedures are present to prevent exposure of personnel to unnecessary risks. Understanding the potential health risks and establishing suitable preventative measures are integral to achieving incident-free operations.